Best Portfolio Manager (General)Award to W.J.M. Ranga Dias. 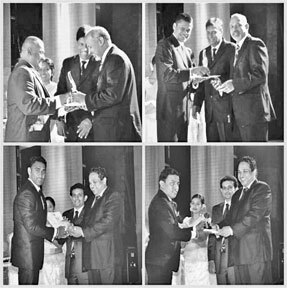 Janashakthi Chairman W. T. Ellawala, was the chief guest at Janashakthi's Mid-Year Awards 2011. Over 140 sales achievers were awarded plaques, weekend packages, cash rewards, trophies and certificates of excellence. W. T. Ellawala while congratulating the winners urged the winners and every team member to give off their best to achieve the year's goals in sales and profitability "The remarkable figures we have achieved are entirely due to your efforts. With your determination and passion I am confident that we can easily surpass the set targets before the end of the year". The Chairman said that JIC had a vibrant portfolio of value added products which met the different needs of the market. "The North and the East is a potentially growing market for insurance.